Prince Harry and his wife, Duchess Meghan Markle arrived in Morocco just after 9pm last night. 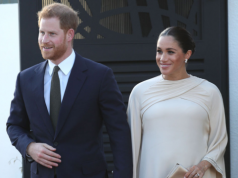 Rabat – Prince Harry and his wife Duchess Meghan Markle landed at the Mohammed V airport in Casablanca on Saturday night. 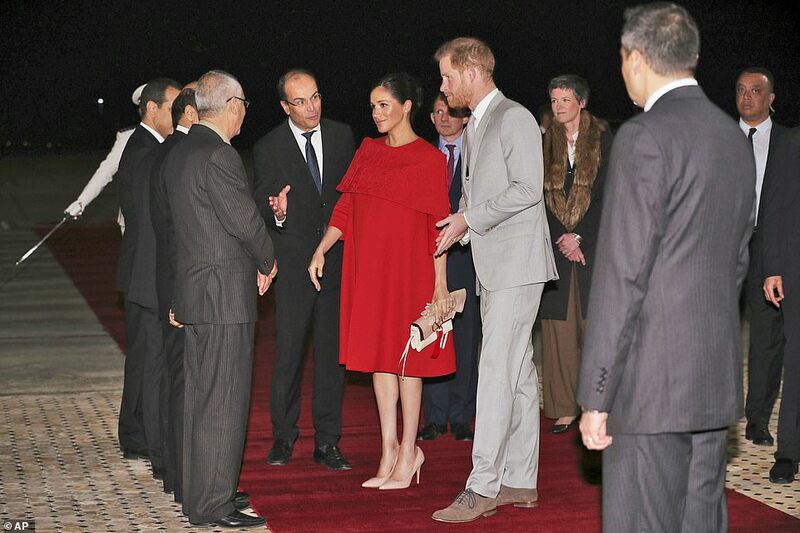 The Duchess is wasting no time stunning Morocco with her fashion, wearing a beautiful red dress off the plane. The Prince was also looking dapper in a classy grey suit. According to Harper Bazaar, the royal couple are accompanied by a team of nine people. Two private secretaries and communication members are included in the team. UK’s Ambassador to Morocco Thomas Reilly received the duke and duchess upon their arrival. The royal couple also observed a guard of honor at the airport. The Wali of the Casablanca-Settat region, Governor of Casablanca Prefecture Said Ahmiddouch also welcomed the royal couple. After arriving in Rabat from the Casablanca international airport, Morocco’s Crown Prince Moulay El Hassan received the royal couple at Rabat’s royal guest palace. Upon their arrival, the duke and duchess observed another guard of honor. 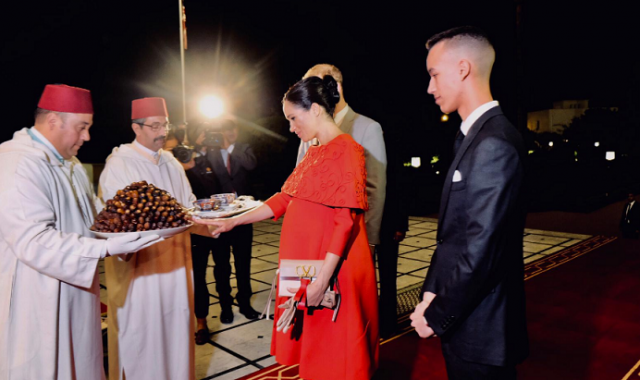 The royal couple were also invited to taste Morocco’s traditional welcoming offering: milk and dates. 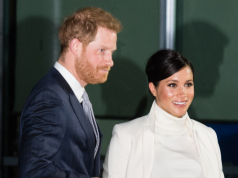 The Duke and Duchess of Sussex will have a busy three days during their stay in Morocco as they will visit several places, including the Atlas Mountains. In the Atlas Mountains, the couple will visit Asni, a small town in the High Atlas mountains 50 kilometers south of Marrakech. 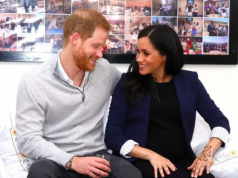 During their visit, the royal couple will discuss several topics, including education and culture and Meghan will take part in a henna ceremony. The couple are also invited to an official reception, the UK ambassador’s residence in Rabat. On their third day, Monday, the duke and duchess will also visit the Moroccan Royal Federation of Equestrian Sports in Rabat, and the Villa des Ambassadors restaurant for a cooking class to explore Morocco’s traditional cuisine. 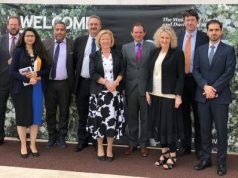 They will also visit the Andalusian Gardens in Rabat.